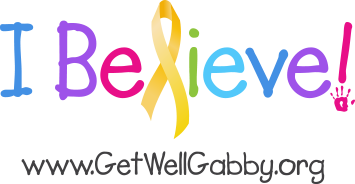 Gabby recently ended radiation treatment and Chemo. She did 6 weeks/30 radiation treatments. The new plan is we attend clinic weekly for a quick check up and then in September she has an MRI to see what progress has been made. After that the new plan could include 5 days of chemo every 28days for the next year. So basically she is in a holding pattern until we see how everything worked. Up until last yesterday she seemed to be getting more energy, and eating better. However last night she started having trouble drinking. When she drank she would cough it up and her head would start to hurt. Also she seems to be much more lethargic, doesn’t really want to do much. We took Gabby to clinic hoping it would only be a few hours long. Unfortunately those few hours stretched to about 9 hours. She needed to be reaccessed and given fluids. She was also started on steroids. A cat scan was done. After talking to the doctor a number of things were discussed. We would watch her over the next few days and see if she was improving. The CAT scan showed swelling in the brain, therefore the ventricles are narrowing which could prevent fluid from draining. So a shunt was discussed that would be put in the brain to allow this fluid to drain. A tube might be needed if the drinking doesn’t improve in order to get fluids into her system. Please forgive me if I didn’t get that all correct. It’s how I heard it. Two days ago we were excited about how well she got off the couch and scooted across the room for a book and now we are discussing possibilities of even more procedures. Does he really need another angel by his side? On Friday my mother’s husband passed away after he lost his long battle with cancer. I have yet to tell my daughters. They know their sister has cancer, they are bright girls and it’s just a matter of time before they ask the question: What about Gabby’s cancer? As I was at his celebration of life to say goodbye, I listened to the grief counselor say a few words about how he was now sitting with god, He was a new angel by god’s side. I realize this was for Joe but my mind drifted to Gabby. We all believe and are praying she gets better. But as doubt drifts in you have to wonder what if? That’s when the anger set in. To myself I wondered doesn’t god have enough angels? Why would he need my five year old? He doesn’t need her. He’s selfish; he wants all the good ones. People kept telling my mother Joe is in a better place, he’s not hurting. Again I thought of Gabby. Ask her if she would rather be sitting by god’s side, or would she rather be sitting with her family on thanksgiving morning in pajamas watching the parade. The truth is she is my angel, my baby, no one else’s. No one has a right to my child but me and her family. If my child is taken it’s a selfish act, it’s not an act of mercy, and it serves no purpose what so ever. It will take a miracle to convince me otherwise. Who is better and stronger for this???????? On Saturday I took place in a grief group. I listened to a person explain that she was better and stronger because of this. I disagree. No one is stronger because of this, I’m not a better person, Gabby isn’t stronger or a better person for it. No one in my family can come out of this and say” I saw the good in what is happening, no one can say I learned so much from it. It’s ridiculous to think that such a tragedy can bring hope, can bring peace, and can bring a better person. To be honest with you I was happy the way I was, I didn’t need to be better or stronger and neither did gabby. It’s strictly my opinion that that most families who deal with this are basically victims of torture.. First the sick child. Each day they go on not know what is causing the pain, why won’t it stop, why does food taste different, why can’t I run with my sisters anymore or swing on the swings, why dos everyone scare me. Torture. Now move to the parents and siblings. Same thing we sit and we watch our child, our sister suffer, not knowing when or how it will stop, not knowing how to put them at ease. Each day, everything you look at is torture. I can’t look at a picture of Santa Claus without crying. Everyone says live day to day in this situation. Well I’m thinking about next Christmas and the one after that. Will she be here? Will she be old enough one day to look at me and say: dad I know you’re Santa Claus? Torture. The other day we were sitting on the couch watching TV. It was a Disney show about first kisses. Gabby looked up at Carolynn and said I had my first kiss two years ago with a little boy in her class. As cute as that was I started to cry, because I wonder will she ever have another first kiss? 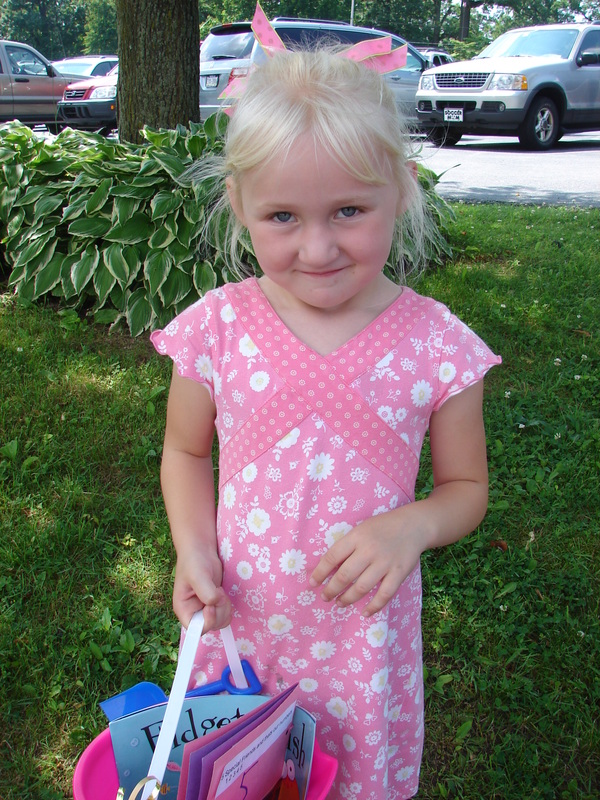 She has watched her sisters get on the school bus for three years; she’s been looking forward to getting on that bus. Will she ever get to? Torture. Every minute of every day for the rest of our lives is filled with the unknowing just another form of torture. It’s torture knowing a five year old innocent little girl that has never lived; never experienced what life can be is now fighting for her life. When people made speeches at my mothers husband services they told great stories about his life, how much fun he had, we are two months into gabbys diagnosis and I have trouble remember how it felt when she hugged me, or how she sounded when she opened a birthday gift and was excited. How is that not torture? 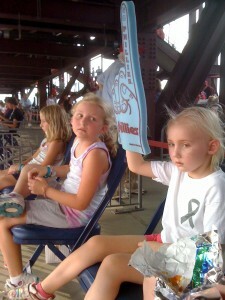 Held up the Phillies foam finger with both hands. It comes down to a few things. We still believe, we know if anyone can do it she can. We have no choice but to learn to deal with the pain, deal with the unknowing, never embrace it, but always be aware it’s there. I don’t know if this will help or not in the “it-just-made-us-stronger/gave-us-a-real-gift” department, but when i was 23, I had a precanerous tumor removed from my intestines. I was the youngest patient the surgeon had ever seen with this type of tumor. Right before I got sick, I had tons of friends, my own little house-cleaning business, and was accepted as a junior-year transfer student at a local university. Once I got sick, I lost my business, my friends drifted away (except for one or two loyal buds), and I had to put college on hold indefinitely so I could land a full-time job that had insurance coverage so I could continue to get biopsies and treatment if neccessary. I kept waiting for the epiphany; that I would somehow see all the good in the situation, that I could see the “gift” in the experience, that I would get my business back, and that the terror and anxiety would abate. I had one well-meaning professional tell me that it was important that I draw strength from the experience, that I was stronger and better for it, etc. etc. The epiphany never came because I woke up to the reality every day. All this to say: You are right. You and your family were already strong. You did not need this. I can’t understand fully because I am not in your shoes with a sick child. I do want you to know that I can appreciate where you’re at with respect to the “better and stronger” hoopla and can empathize with you and your family on this. You and your family are NOT “less than” because you do not buy into the “stronger and better” aspect. Everyone goes down this path in their own way. Hang in there and keep posting. LOL@ Gabby cheating at Connect Four. I did that endlessly as a little kid. John, you’r honesty is refreshing and I can certainly understand how you feel. There is no reason not to be as God knows our heart wether we share it out loud or keep it hidden in ourt thoughts. You sharing how you are really feeling is probably the best thing you could do for yourself. I am sorry Gabby is having more trouble. She is never far from my thouhgts and prayers. That’s all I can do. No great words of wisdom. You were just fine the way you were, I agree. My grandson had 3 open heart surgeries before he was 2. He is now 10…healthy. CHOP was the closest place to heaven when we were going through hell. God can take your shouts…we believe in you…CHOP…and God’s love. Hang on even if its by your fingertips…Gabby’s courage will lead you. Feel free to smack the person that says to your face that you should draw strength from this and there is a “bigger plan”. That should make you feel better, if nothing else. 😉 Give them an extra one for me too because as my brother’s were going through their cancer treatments, I just walked away shaking my head. I know people are only trying to help and they don’t know what else to say…but I’m hoping the mental image at least gives you a little smile. Hi John, I’ve been reading your very painful comments on website. I think you deserve a lot of credit for having the courage to be so open and raw about your feelings. I used to live in Phoenixville, or I was a foster parent for nearly 10 years. Fortunately I had a lot of kids a lot of experience in crisis; not to mention a whole lot of training when the worst experience in my life happened. I actually reached out to the police were at the hospital, at the time to see if they knew what was going on. Nobody really knew anything; and on the phone rang again. A precious , a replaceable, human life was gone. A child was murdered. I had no choice, I had to climb the stairs again can say the words that would devastate this precious young man I love so much who had been through so much as life already. I cannot write the story without the emotions flowing breaking all over again. I am not stronger for that experience, is an unimaginable pain still hard to bear more than 10 years later. I wanted to share that so you would see, will I have no idea of your unimaginable pain, maybe I can offer couple of thoughts for you to reflect on. First, after working with a few hundred kids in residential facilities, as well as is a foster and adoptive parent, the thing I know best is that children know far more than we realize. Somehow the truth always comes out and somehow the best course of action is usually to find a way to share the truth. Your children are sensing your pain, they probably don’t have words for what they’re feeling today. Sometimes the best thing is to share the facts as best you can. I am not sure your children are protected best when they know the least. Your children experience your pain more than they experience your words. They probably need help expressing themselves and finding words for what their experiencing from the adults around them. John, it’s also OK not to be all powerful. Sometimes the most powerful words you can say it’s your children are, “I made a mistake.” You’re showing your girls is perfectly OK to be human being, and that being flawed can be a strength. I’m not suggesting a course of action, I hope to give you something to think about, and I would strongly encourage you to speak to a therapist or social worker who can give you some feedback. Like the grief counselor you’re talking about, I think it’s important to entirely ignore people, who while well meaning, cannot possibly tell you what the future will bring. The best counselor does not dole out advice, the best counselor ask questions that help you find the answers that will work best for you. In closing, I hear your anger; I feel a pain in my heart which is utterly indescribable as I’ve read your words. Your words also shatter my soul. A beautiful, irreplaceable, precious life is on the line and God must hear the streets of Heaven are too crowded with angels this night. A man suffers for his wife and his daughter’s and the very future of his family. He has found himself powerless against this awful disease and no matter what tomorrow brings the world will never be the same. All I can say it is there are people out here love you, your children, your wife and everyone who’s been touched in the smallest way by this fight forced on your family. Share with us whatever you need to share, lean on us for any small thing. God bless you. God bless Gabby. God bless your family. AMEN to that Rob. well said!! Praying for and thinking of you and you’r whole beautiful family. Hi John, recently heard about Gabby and am at a loss for words! I can’t begin to imagine what you are going through and I think of you all almost every time I see my 5 yr old. If there is anything I can do to help with whatever please let me know. As a parent of a chronologically ill daughter, I admire your strength and believe every word you wrote. No parent is selfish for wanting to keep thier children. That’s the way it should be. Noone else has the ability to totally understand. Even as we try to help and do what ever we can do for the family and the child, the fact is when it strikes at your door, you feel alone and helpless. These medical situations are so out of our hands as we try to remember what the docs say every time they come in to the room. My family will be praying to storm heaven for Gabby and all of you. May you find hope in knowing so many are praying and believe that all those prayers will surely get unanswered. My heart goes out to you and your family. I understand your anger and God does to. Miracles do happen and, Gabby is on and at the top of my prayer list. CHOP is a great hospital and Gabby is getting the best care. She is an adorable child and deseves the best! First- So many prayers up for Gabby and your family. I don’t know you in real life but your honesty in writing is truly amazing. I heard Gabby’s story through Facebook and have been reading here for a couple of weeks. Thank you for sharing this story…as some others mentioned, hopefully having so much support behind Gabby and your family brings at least a small comfort. I will keep the prayers going!